Several Local MSP’s from various parties today asked questions in parliament over the North West Community Campus – following the injury of a second child at the school last week. Education Secretary John Swinney told them processes in place to ensure effective scrutiny of building projects in Dumfries and Galloway are ‘not as effective as they could be’ and said council officers should pay close attention to the recommendations made by the expert who reported on the fiasco of DGOne. Joan Mc Alpine MSP raised concerns with Mr Swinney, that Dumfries and Galloway Council had failed to learn lessons following the damning Cole Report into the disastrous DGOne project. The report – while being clear that the failures were the fault of the contractor – was highly critical of the lack of oversight the Council had given to the project. “Earlier this year the independent Cole report exposed failings in the way Dumfries and Galloway council officers monitored the contractors at the DGOne leisure centre which closed for safety reasons. “It’s important that when there is material such as the Cole Report produced we follow and observe those recommendations and the issues raised. “What strikes me about the information I have seen in relation to Dumfries and Galloway Council’s handling of this matter, is that they have been given a range of assurances by the contractor, they have sought to verify these. The fact that we are where we are today shows that this process has not been as effective as it should be. Last week, Ms McAlpine revealed that she had written to the Chief Executive of Dumfries and Galloway Council on 29 August after the first child was injured by a falling door, raising these questions, and seeking assurances as to the safety of the building. She has still to receive a reply. Local MSP Colin Smyth has also raised his concerns in the Scottish Parliament that that North West Community Campus contractors Grahams and developers Hub South West are not being properly held to account. Colin Smyth raised the issues while questioning the Deputy First Minister and Education Secretary, John Swinney, on the current closure of the North West Community Campus in the Scottish Parliament. 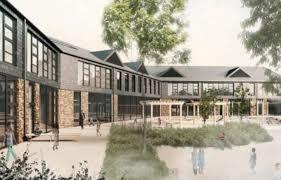 Under Government’s procurement rules the council must use developers Hub South West and a small select group of contractors for any projects under the Government’s schools for the future programme. Colin Smyth fears that process takes control out of the hands of the council resulting in a lack of accountability and scrutiny. North West Community Campus currently remains closed to pupils, while contingency plans are being drawn up to allow pupils to return to full education as quickly as possible. Speaking after the question Colin Smyth said, “Once again we have a situation where a private contractor has received millions of pounds of taxpayers money but has completely failed to deliver a building fit for purpose. As a result of the Scottish Governments rules the council have no choice but to use the select list of private contractors and when it goes wrong they have to bring in an independent third party. Grahams and developers Hub South West gave the council clear assurances to Dumfries and Galloway Council that the building was safe for learning and teaching to proceed. These assurances have been broken and the contractors and developer must be held to account for that, yet it seems the council are almost powerless to do so which is exactly the same problem they had over DGONe . It stime for the Scottish Government to review how these contracts are awarded and managed because their current rules are failing badly”. Galloway and West Dumfries MSP Finlay Carson has challenged the Scottish Government to back his calls for a full public inquiry into the closure of the North West Community Campus in Dumfries. The local MSP who has led the calls for a full inquiry since the school was shut to pupils and staff, for a second time, on Friday questioned Education Secretary John Swinney MSP in the Scottish Parliament. Mr Carson believes parents, pupils and staff deserve full transparency from Dumfries and Galloway Council and the contractors over a number of incidents which have blighted the super school in recent weeks. Despite a senior council officer saying there were more checks on the new school than normally would happen, a pupil has again been injured, resulting in the school now shutting it’s doors. Mr Swinney stopped short of backing a public inquiry, stating in his response to Mr Carson, “There have to be investigations into what’s gone wrong here, there has to be transparency around these issues and certainly from the Government’s perspective I’d expect that to be the case to ensure that we have full information on what’s gone wrong here. Commenting local MSP Finlay Carson said: “Everyone associated with the North West Community Campus is rightfully concerned. We must be given confidence that the building is a safe place to study and work. “That is an absolutely unacceptable situation and is why Dumfries and Galloway Council must be fully open with their findings. “I want to ensure that is the case, which is why I challenged the Scottish Government to back my calls for a public inquiry into just what has gone wrong here. Parents and staff must get the answers they deserve. “This situation is not going to go away until the safety of everyone at the North West Community Campus can be completely guaranteed and unfortunately we have no idea when that will be.